Home » The Writer’s Dictionary » What is the Past Perfect Progressive Tense? Past perfect progressive definition: The past perfect progressive tense (also called the past perfect continuous tense) is an English verb tense that expresses ongoing actions in the past that have ended. 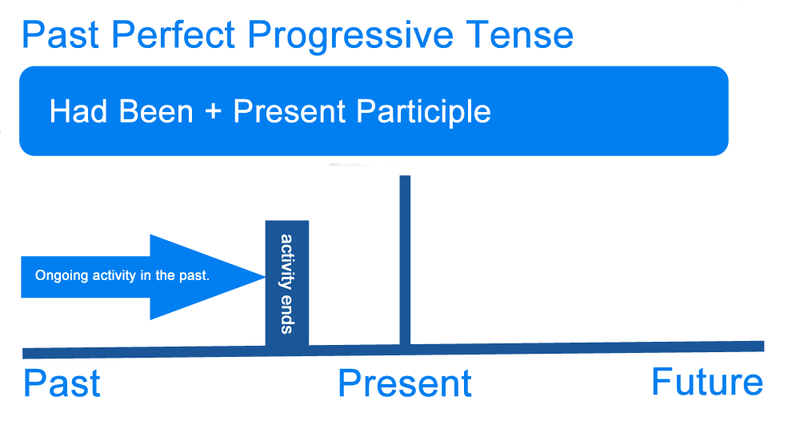 The past perfect progressive is a complicated verb tense. It is a combination of two verb tenses: the past progressive tense and the perfect tense. The past perfect progressive tense is mostly used to express actions that started in the past and continued up until another time in the past. Here is a depiction of what the past perfect progressive tense describes. As you can see, an event or action begins in the past and continues up to another event in the past. It had been snowing for two hours before the roads were closed. Past action in progress: It had been snowing. Other action in the past: Roads were closed. They had been planning their trip for two months when Sarah said she couldn’t go. Past action in progress: They had been planning. Other action in the past: Sarah said she couldn’t go. The past perfect progressive verb tense is relatively easy to form because its components remain fairly consistent. With the past perfect progressive, the variants are the subject and the present participle. The verb phrase “had been” remains consistent regardless of subject or verb. The past perfect progressive is most often used to express actions that started in the past and were in progress before another action began in the past. However, the verb tense has other uses as well. Its various uses are outline below. This means that an action started in the past and was in progress. Then, another action that also occurred in the past began. Furthermore, the action that was in progress stopped when the following action began. The engine had been running for an hour before it stopped. Here, the running engine is the action that started in the past and was in progress. This action occurred for an hour before it stopped. This means that something happened as a result of something else. Both of these actions occurred in the past, and one of them occurred over a period of time. Jason went bankrupt because he had been overspending. Here, the action that was in progress is the overspending. This overspending caused the bankruptcy. Both of these actions occurred in the past. Define past perfect progressive: the definition of past perfect progressive is a continuous action that was completed at some point in the past. a complicated verb tense that is used to express actions in the past. a verb tense that expresses actions that were in progress in the past before something else occurred. 1 What is the Past Perfect Progressive?